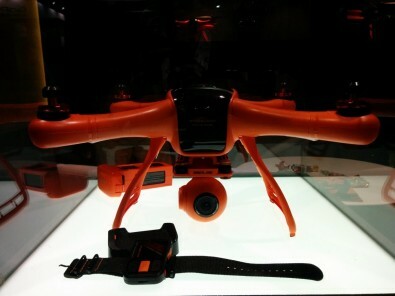 ProDrone BYRD - launched at IBC. Smartphone innovation such as single-chip accelerometers and GPS systems have decreased in price, increased in number and given the UAV market lift-off. IBC set aside an outdoor cage for visitors to see or pilot unmanned flying vehicles in action. DJI has a market leading technology which has attracted other companies to build accessories around it. These include the TVU Networks TVU One transmitter which can sit onboard a DJI Inspire and stream HD live with a 1 second latency. The quadcopter Wingsland Minivet includes support for 4 million pixel static picture shooting, HD 30p recording plus an automatic frequency hopping function in the controller that increases flight safety. Fotokite were showing a new consumer version of the Fotokite Pro, the $299 Fotokite Phi which can fold up and fit inside a small cylindrical tube. This drone is tethered to the operator. Broadcaster CNN has already pre-ordered large numbers of the Phi and has filed for a 333 exemption with the FAA. This allows for legal commercial flights in airspace in the US. Fotokite has already got exemptions in other countries including France and Switzerland. The Phi doesn’t feature a gimbal like the more expensive pro version and the height you can fly it will be limited to around 16 meters (52ft). This height will be more than enough to get a nice aerial perspective of whatever you are shooting. The Phi has a flight time of around 15 minutes and the battery is interchangable allowing the drone to be deployed again very quickly. The Phi’s technology allows it to fly itself without any control from the operator, so you don’t need to be a skilled pilot to use one. It has the added advantage of being able to be deployed immediately without waiting for a GPS lock or having to do calibrations. Once in the air, the Phi is controlled via a smart leash that lets the operator use gestures to adjust orientation and position. The recently-introduced Connex zero-latency wireless video link for drones has received software and hardware upgrades, including support for a greater variety of gimbals, remote controllers and flight controller telemetry devices as well as improvements to the on-screen display, compatibility with other 5GHz transmitters on the drone and new safety features. Debuting at IBC was ProDrone BYRD, a UAV designed to fold up into an iPad sized package to fit into a backpack. Apparently “ruthlessly tested in the world’s harshest climates to guarantee unconditional quality” the design has a modular payload for quick exchange of gimbal and camera combinations. The drone will launch later in 2015 priced between $800-$3000 depending on package.